Twenty of the latest thoroughbred colts from the Lamborghini stables will be built and loosed onto the world. 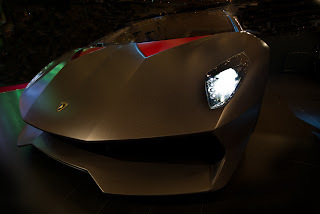 Seen at the Luxury Car Show in Jeddah in November 2012, the all carbon-fibre Zesto turned more than a few heads - it was a show stopper. 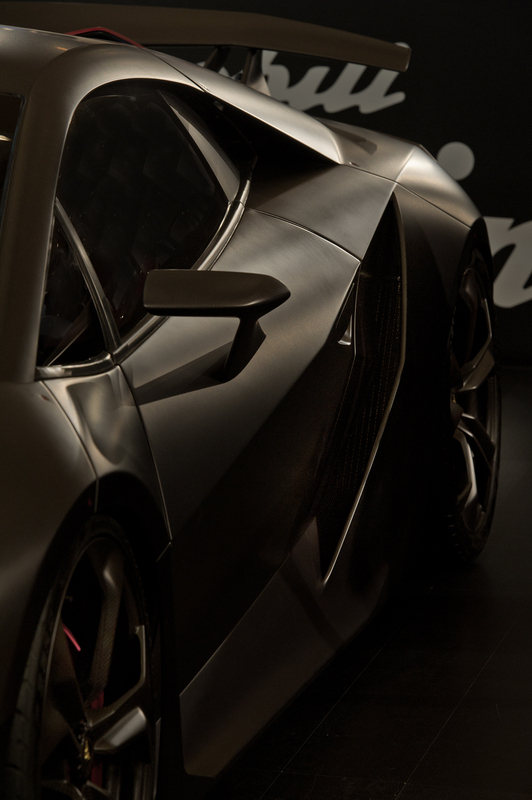 Everything that can be carbon fibre is carbon fibre, right down to the wheels. The interior is to say the least, minimalist; a carbon fibre cross piece suffices as a dashboard with the sparse instrument panel mounted on the crosspiece rather than in it. Sitting in the Sesto is a strange experience. The driver can see his feet , visible past the instrument console, protruding forward to the pedals! While the Sesto Elemento retains many the style elements associated with the marque and, as a whole car, is still very much Lamborghini, the Sesto is a photographer's dream to image. 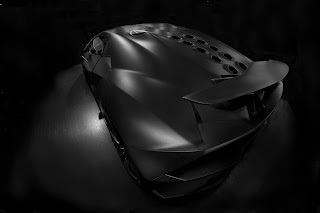 The whole car looks as if it has just rolled out of a Batman movie - exotic and almost overdone with the extreme "stealth fighter" shape. 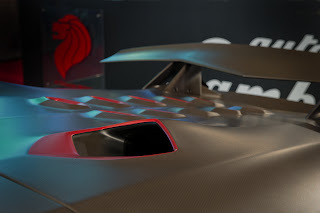 The model in Jeddah - according to the staff on the stand number 001 in the 20-car production run - was finished in bare carbon fibre charcoal grey and - well, pink. It was a disturbing colour for it was a pink that was not quite red. 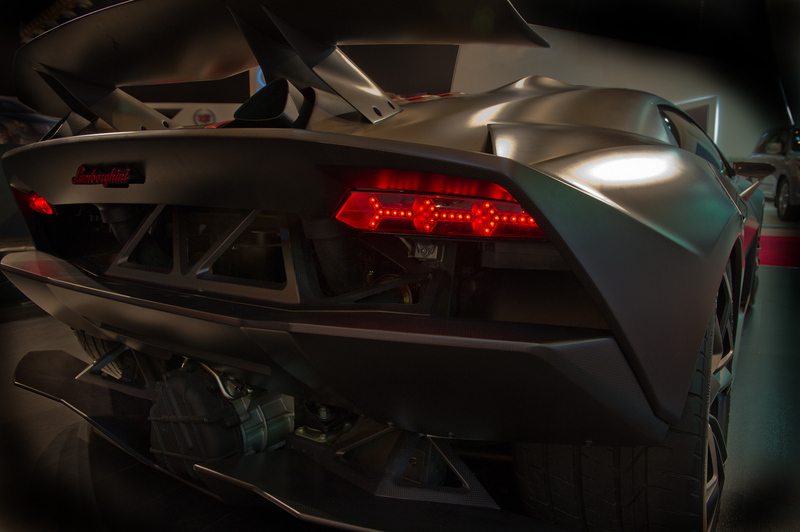 Only Lamborghini would do that and get away with it. But, the devil - or in this case the real joy of this car to a photographer - is in the detail. 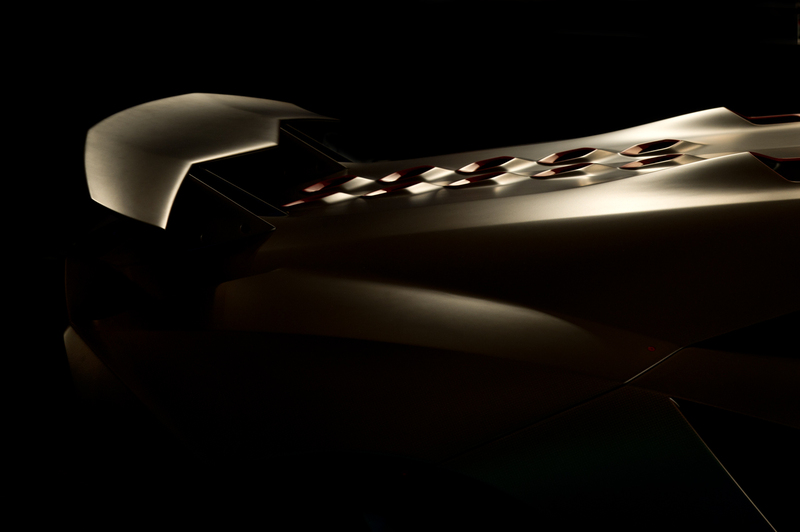 Using available light, a Nikon D3s and negotiating a bit of time with the car when the public had gone, I was able to explore the sculptural detail of the Sesto. Curves, sharp edges, unexpected directions of standard elements (the wing mirrors point forward on their mounts!) and the glorious semi-matte finish of the car were simply wonderful. In a sense, this was collection of design elements that individually were exciting to behold and clearly the work of talented and patient designers and engineers. Put together in the whole car they work. For me, the elements were more exciting than the whole as it was the first time that I had seen startlingly good visual design really working in a car. I suspect that the designers were given free reign in this one within an overall concept. Smooth and curvaceous from the rear three quarter view (above), the Sesto is more a stealth car from the front (below). The rear-end is all business. The rear mounted gearbox (below) hangs out F1 style. 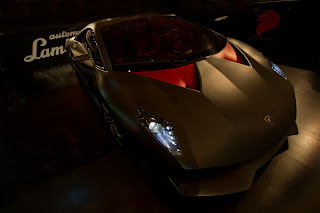 The Sesto was surely designed to send photographers into paroxysms of delight. The rear wing (below) combined with the engine vents is a masterpiece. Even the detail such as the forward-leaning facing rear-view mirror (below) is eccentric and adventurous.